Although a minority of Protestants, including French Calvinists or Huguenots, could be found in New France, most of the population identified as Roman Catholic. French colonial homes often contained a variety of objects related to Catholic ritual and devotion. These included religious art, crucifixes, rosaries, prayer books, and prayer stools known as prie-dieu. Use of the prie-dieu outside the home in chapels and churches was officially regulated by a strict set of rank-based rules; these were often flouted by public officials and others who used them as they saw fit regardless of whether or not a social superior was present. Between 1690 and 1720, numerous "affaires du prie-dieu" erupted between colonial governors, bishops, and military officers over who had rights to use a prie-dieu. In similar fashion, parishioners of the church and future cathedral of Saint-Louis in New Orleans bickered over who had rights to be closest to the altar. Claiming proximity to the altar during the mass mirrored contemporary practice whereby prominent parishioners could be buried in vaults under this space, where the doctrine of transubstantiation held that the bread and wine were transformed into the Body and Blood of Christ during the consecration. Returning to private homes, Étienne Veron de Grandmesnil of Québec owned a crystal bénitier, or holy water font, in 1743. Anne-Marie Champoux, the widow of Jean Soumande, and merchant Joseph Riverin of Québec owned silver bénitiers in 1738 and 1756, respectively. A detailed entry in the succession of Nicolas Pineau, bourgeois of Québec, described an enameled bénitier representing the Virgin along with a tin-glazed earthenware bénitier and crucifix in a gilt frame in 1746. The home of Lucien Bouteville, a bourgeois merchant of Québec, was inventoried after the death of his widow, Charlotte de Clérambourg, in 1713, and included a faïence chamber pot, and a bénitier, or small holy water font. The example at left was made in Nevers, a center for faïence production in Burgundy. An extraordinary reference to a platinum crucifix can be found in the 1729 inventory of royal notary François de Lacetière in Québec. ​In Martinique, the circa 1760 inventory of Madeleine Nolière lists a reliquary containing an image of the Virgin Mary. Crucifixes were common marks of a family's faith. These were generally carved of wood or ivory and sometimes set within carved giltwood frames. These frames might be further embellished with a textile upon which the carved cross and figure of Christ could be placed. Marine Lieutenant Pierre de Rivon de Budemont owned both a sculpted Christ and a crucifix set within gold frames in Montréal upon his death in 1731. The grande chambre of Marine treasurer Jean Petit contained an ivory Christ set within a giltwood frame in 1732. 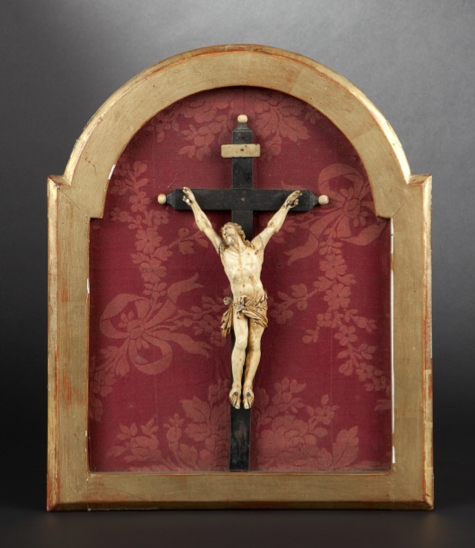 Often hung on the wall in bedchambers near the bed, crucifixes marked piety and were an important part of domestic devotions such as morning and evening prayers. Such sculpted objects might be used alongside painted or printed devotional images, as seen in the crucifix and painting of the Virgin inventoried in the chambre of Charles Guillimin, a member of the Superior Council in Québec, and his wife Françoise Lemaître in 1739. Some elite homes also contained art with religious themes. Notary Florent Lacetière owned an image of Saint François de Sales in 1729. Philippe Peiré, a bourgeois of Québec living in the rue du Cul-de-Sac, owned a variety of religious paintings when he died in 1733, including a painting of Christ, "two other small paintings of Our Lord and the Virgin in their giltwood borders," and another depicting the Holy Family. Jean-Baptiste Couillard de Lespinay, lieutenant-general of the admiralty, owned a framed painting of the Christ Child and two "cadres de dévotion" in 1735. In 1744, Governor Jean-Baptiste Duquesnel's apartment in Louisbourg contained a painting of Mary Magdelene contemplating a crucifix. Wealthy families also commissioned paintings, known as ex-votos, that were given to churches or religious communities as thanks for miraculous cure from illness or as part of a prayer for divine protection. Marie-Angélique Riverin, the wife of Superior Council member Denis Riverin, commissioned the colonial artist Michel Dessaillant to create the ex-voto below. She called upon Saint Anne, the mother of the Virgin Mary, to protect her and her children as they made the voyage to France from Canada around 1703.